Call me crazy, but I think a child’s name should be meaningful. It should represent more than a passing fad or whim. 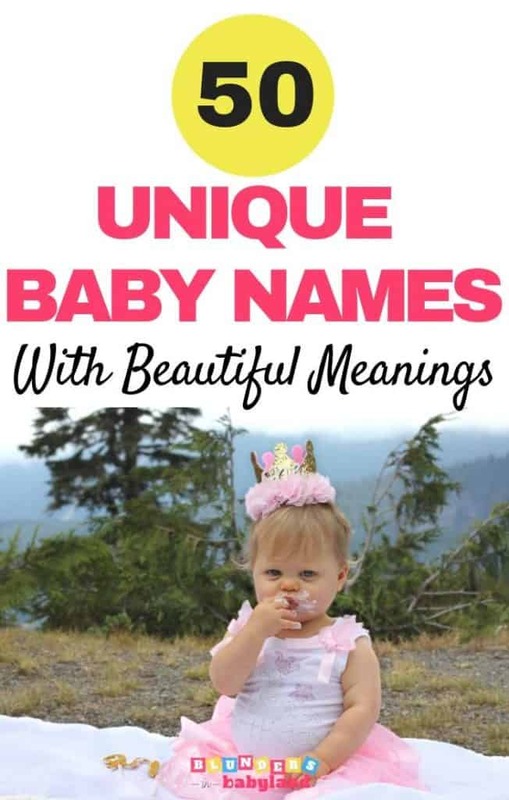 For my firstborn, I searched endlessly for unique baby names with beautiful meanings. How about you, Mama? Have you been searching endlessly for “the one”? If so, I hope you find it here. Below are a few of my favorite unique baby names with a meaning. This classic, old English name translates to “brave” or “hearty”. A beautiful, feminine name, Ayla has both Aramaic and Hebrew origins. Its variations mean “halo”, “moonlight”, or “shining”. Who doesn’t love a foreign, strong name. Bjorn means “Bear” in Germanic languages. 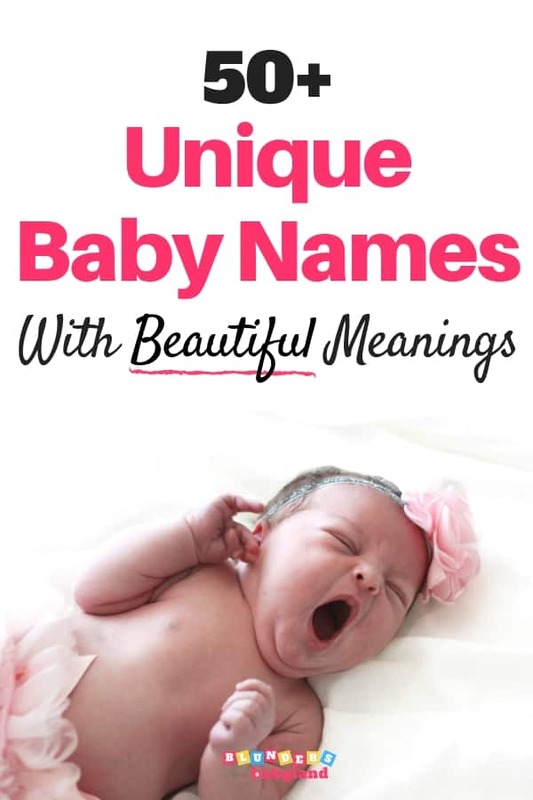 A special name for the baby that “brings joy”. French in origin, Colson is perfect your “coal-black” haired boy. This name can have several meanings, depending on how you choose to spell it. “Cala” means “castle” in Arabic, but spelled “Calla”, it is also a representation of the beautiful Calla lily. Another regal, Norse name for your black-haired boy. Originally the female version of Darius, Dariela is now French for, “gift” or “beloved”. While vintage is very popular right now, Emery can still be considered an unique baby boy name with a powerful meaning. In fact, that’s exactly what Emery means, “Brave” or “Powerful”. A variant of the Hebrew name, Eve, Eiva is rich in history. The name’s progenitor, Eve, the earth’s first woman, means “the living one”. Later, according to Celtic legend, Eva was the most powerful woman-warrior in the world. Another Irish name, Fallon translates as “leader” or “in charge”. This name can also be used for girls as “Fallyn”. Unique and exquisite, Freida is a German name meaning, “peaceful ruler”. Literally meaning “gray”, Grayson is the perfect name for fall babies, when skies are overcast. Gisele has many variations, but most fall into the German translation of “pledge”. An old English name for “deep valley”, this name also attracts readers of the classic, Catcher in the Rye. Watch out if you choose this name. Hattie means, “ruler of the home” in Old English. Although popular in the 80s-90s, the Hebrew name Joel is a unique baby boy name, meaning Jehovah is God. Jalissa is a variant of the Germanic name, Alyssa, meaning “kind” or “noble”. Sweet and feminine, Liliana is a unique baby girl name meaning, “lily” or “innocent”. A shortened version of the Greek name, Alexander. Killian is an old Irish, religious name meaning “associated with the church” or “of the small church”. Depending on its preferred origin, Nico can either mean “smiling” in Japanese or “victorious” in Greek (nike). Nilsa or Nilsine is a very unique baby girl name, but it comes with a powerful meaning: “champion”. A variant of Orrin, this Gaelic name actually means, “pale”. While the actual translation is “oak clearing”, it can represent the strength and charisma of the Wild West sharpshooter, Annie Oakley. If you suspect that you’re carrying a rough-housing baby boy, Patton is the perfect name. It’s English for “warrior or fighter’s town”. Latin for “ancient”, Priscilla was one of the first Roman Christians. Although this Irish name is a little on the nose, it’s perfect for the child of literature enthusiasts. Stemming from the Celtic name, Quinn, Quinlin means, “graceful and strong”. Rhett is a handsome English name once made popular from the America novel, “Gone with the Wind”. It means “wise counsel” or “advice”. A perfect fall baby name, Roux means “reddish-brown”. This name has been one of my favorites for years and I hope you like it too. It’s Old English for “strength” and “eternal love”. Definitely appropriate for our little blessing, yes? Greek in origin, this biblical name means “title of honor” or “to honor”. Hebrew in origin, this beautiful name means “by water” or “dew from God.” Perfect for those much prayed for baby girls. Nigerian for “second daughter”, it’s the perfect name for the newest addition of the family. Back in its day, Valen was the “Jason” or Brian” of Rome. Now a very unique baby boy name, it means, “strong” or “healthy”. Is music a huge part of your life? Named after the songbird, Wren is a simple symbol of your dedication to music. Wilhelmine, although this name is more common in Germany, it has a beautiful meaning: “protector”. Although this name is rising in popularity, it’s still definitely unique! Xavier means “splendid” or “bright”. Ximena, also spelled Jimena in Portuguese, is perfect for those unborn baby girls that seem to listen carefully for your voice. It means “listener” or “one who listeners”. “Y” names aren’t that popular in the US but this one is unique and possibly quite perfect for your baby boy. It means, “born at Christmas time”. Say it a couple times and it actually sounds pretty cool. You might have heard this one recently. Yara is a name made famous by Game of Thrones, appropriately meaning “water lady”. Zayne actually has three distinct meanings: “grace and beauty” in Arabic, “God is gracious” in Hebrew, and possibly “seventh”, also in Hebrew. And finally, Zillah, a sweet Hebrew name meaning shade. That’s it, Mama! I hope you enjoyed my list of meaningful unique baby names. If you’d like to find more unique baby names, check out my post, 30 Autumn Baby Names You’ll Fall In love With.